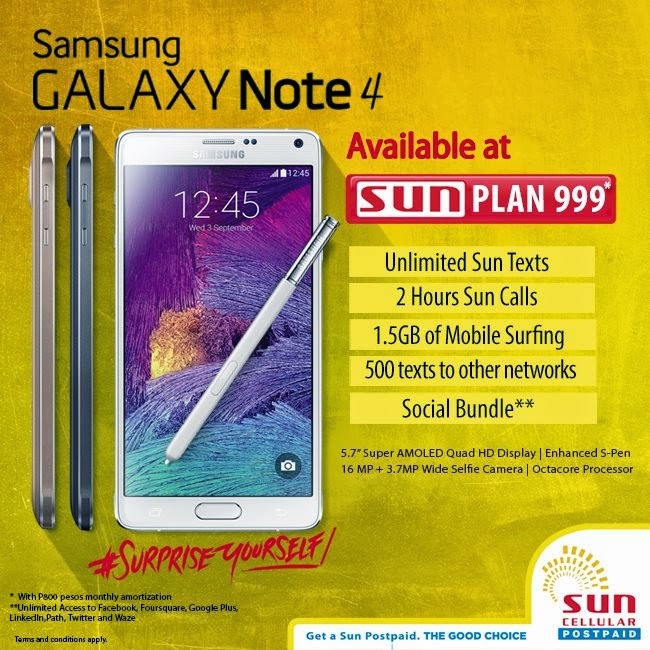 Philippine telecomunication gamer, Sun Cellular finally offered the Samsung Galaxy Note 4 on their Plan 999. The Plan include unlimited texts and 2 hours of calls to Sun Cellular subscribers, 500 texts to other networks, 1.5GB of mobile internet and unlimited access to several social media services such as Facebook, Twitter and Waze. Meanwhile, the Samsung Galaxy 4 is not free on this plan, subscriber must pay additional ₱800 to get the device. This mean's, a total of ₱1,799 every month should be pay for 2 years or 24 months. The Samsung Galaxy Note 4 on Sun Plan 999 packs with powerful specs including an Exynos 5433 chip clocked at 1.9GHz octacore processor with Mali-T760 GPU and 3GB of RAM. There's also a 32GB onboard storage of the device plus a micro SD card slot that support up to 128GB. In addition, the phablet sports 5.7-inch Quad HD Super AMOLED display with 1440 x 2560 resolution at 515 pixel per inch (PPI) density and a Gorilla Glass 4 scratch protector. The Note 4 equipped with 16 megapixel autofocus main camera with optical image stabilization (OIS) and Led Flash. A 3.7 megapixel camera on front is also added for taking selfie. With 3,220mAh battery, it was running on Android 4.4.4 Kitkat OS with TouchWiz UI. what was the color available?